Netbook with IPS. 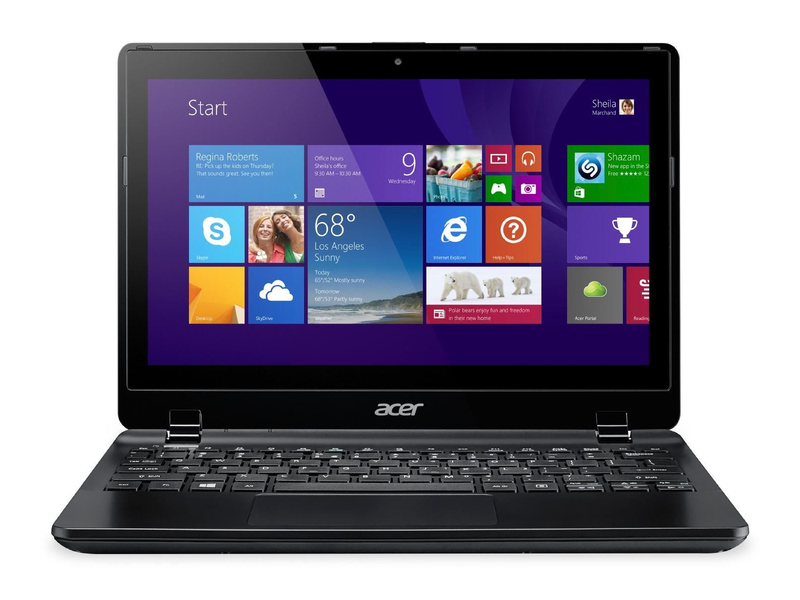 This small Acer laptop has good battery life, an IPS panel and it runs silently. Windows 8.1 Professional (64-bit) hints towards the business uses of this model. The TravelMate B115-MP-C2TQ is the "serious" sibling of the Acer Aspire V3-111P and Acer Aspire E3-111, which we previously tested. Potential buyers of this notebook will be business users, which explains the Windows 8.1 Professional (64-bit) OS found on the notebook. The Aspire V3-111P was able to score points with us thanks to its long battery life and good keyboard. In the following in-depth review, we will find out what its sister model has to offer. The competition of the TravelMate is numerous: all 11.6-inch notebooks which are priced under 500 Euros (~$607) are ready to throw in their lot with our test model. 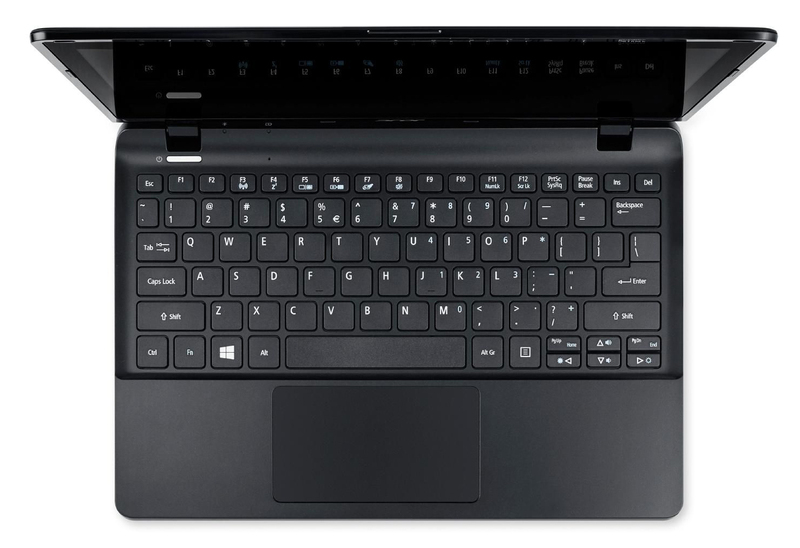 For example, the Lenovo ThinkPad Edge E145 and the Asus EeeBook X205TA-FD005BS are prime competitors. The TravelMate has the same build as the Aspire V3-111P and the Aspire E3-111, so we will not discuss the case, connectivity, input devices or speakers any further (unless there are major differences). For more information about these topics, we suggest taking a look at the reviews of its siblings. The TravelMate has the same build as the Aspire V3-111P. However, there is a major difference, aside from the case colors; the TravelMate has a display cover made of brushed aluminum whereas the Aspire uses synthetic material. As such, the TravelMate cover is sturdier. The TravelMate is intended for business users as is shown by the Windows 8.1 (64-bit) Pro OS. The Acer security software "ProShield" is preinstalled, but additional security features, like a Trusted Platform Module or a fingerprint reader are not included. The TravelMate buyers get an accessory which the buyers of the Aspire will not get: an HDMI-to-VGA adapter. The TravelMate uses a glossy 11.6-inch display, which has a native resolution of 1366x768 pixels. The brightness (181.7 cd/m²) of the panel is not impressive as we have come to expect a value higher than 200 cd/m² as a minimum. After all, this is a small, portable laptop which is supposed to be used in various places. The contrast (744:1) and black value (0.27 cd/m²) are quite good. The display has surprisingly good colors. The DeltaE 2000 deviation with factory settings is a mere 3.51. This puts it quite close to the ideal range (DeltaE smaller than 3) and the panel does not show a blue tinge. 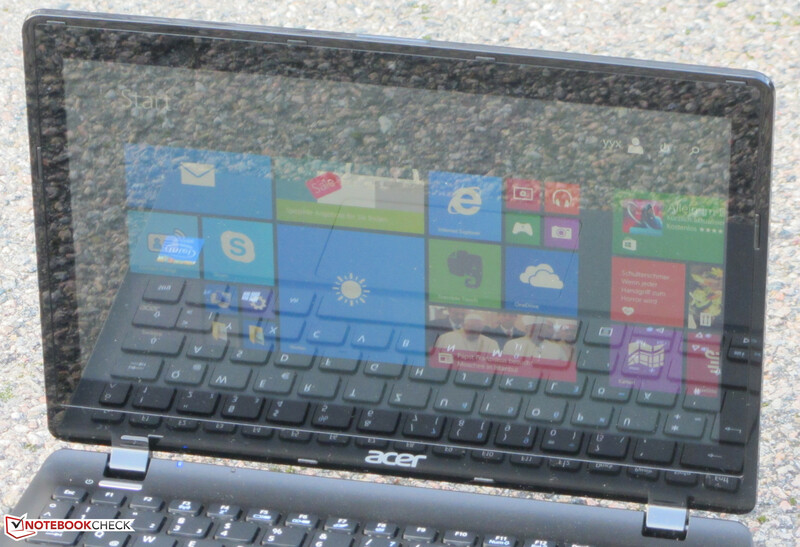 As Acer has given the small laptop an IPS panel, the viewing angles are great. However, the device cannot be used outdoors due to the reflective surface of the display and poor brightness. Outdoors, it should only be possible to use the laptop in a well-shaded area. The TravelMate B115-MP is a simple 11.6-inch notebook which is predestined for typing and surfing thanks to its long battery life. The TravelMate is aimed at business users, whereas the Aspire V3-111P puts the focus on private users. Our test model is available for around 420 Euros (~$510). 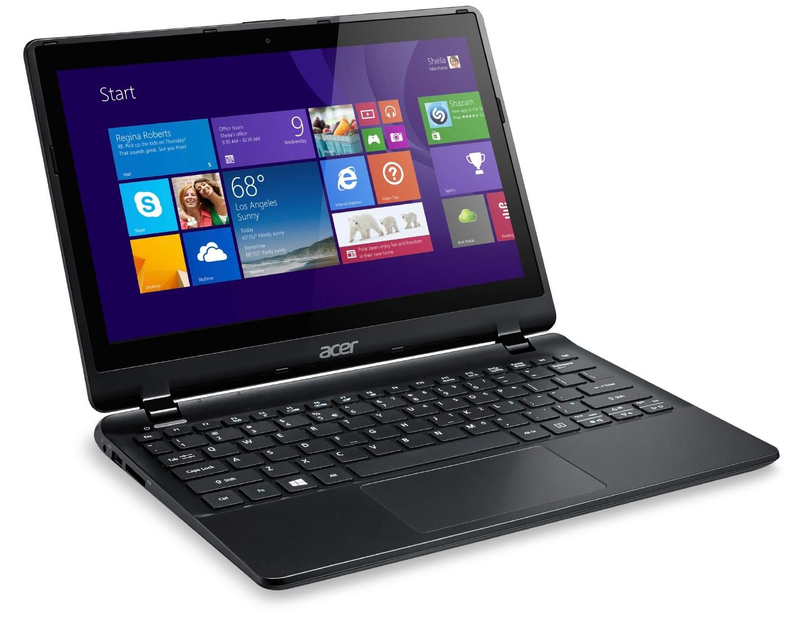 Acer offers various other configurations - with or without touchscreen. 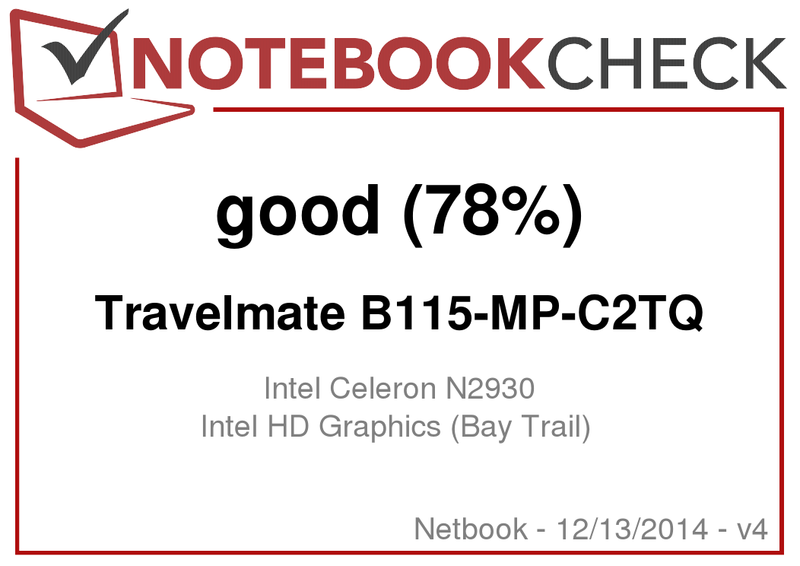 The Intel Celeron N2930 quad-core CPU (Bay Trail) is the heart of the TravelMate. It has a TDP of 7.5 W which allows for passive cooling of the CPU. The processor runs at a base clock speed of 1.83 GHz. Turbo can boost the speed up to 2.16 GHz. Despite passive cooling, the CPU offers its full performance. The single-thread tests of the Cinebench benchmarks are run at 1.83 - 2.16 GHz. The multi-thread tests are run at a constant 2.16 GHz. The Celeron N2930 is one of the weakest processors currently available. The Core i3 or Core i5 CPUs easily outpace it. The AMD competitor of the Celeron would be the A4-5000 APU. We did not find any major issues, as the laptop runs smoothly. The results of the PCMark benchmarks are appropriate for the performance of the CPU and place in the bottom third of the performance table, where it is surrounded by various other Bay-Trail CPUs. A Seagate hard drive has been installed in the TravelMate. This HDD offers a capacity of 500 GB and works at 5,400 rpm. The drive offers good transfer rates. 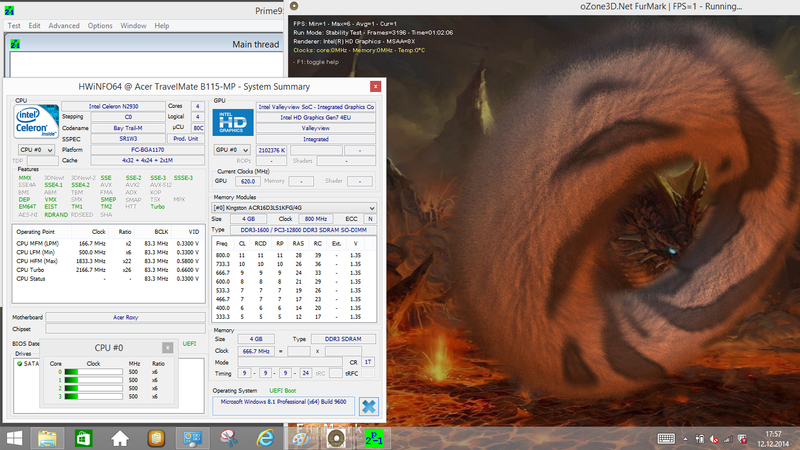 The HD Graphics IGP from Intel can be found in our test model. The chip supports DirectX 11 and operates at speeds of up to 854 MHz. The results of the 3DMark benchmarks are as good as we expected. A notebook like the Asus F200MA, which uses the same IGP, delivers slightly worse results. The reason is clear: the IGP of the Asus model operates at a lower speed. The AMD competition, the Radeon R4 (Beema) and the Radeon R5 (Beema), are much more powerful. The performance of the hardware is not strong enough for modern 3D games. A few games can run at an acceptable fps. If you want to play on the test model, you should stick to the games found in the Windows Store. The TravelMate does not have a fan which means that the only noise emissions audible are from the HDD. Those are very quiet and hardly noticeable. The TravelMate B115 in the stress test. The stress test (Prime95 and Furmark run for at least an hour) performs the same way on the test model every time. In the first 5 to 10 minutes, the CPU and GPU run at full speed and then the speeds drop slowly so that the cores can cool down. After this, the speeds once again rise. This up and down behavior is always present. The CPU speed can drop down to 500 MHz and the CPU and GPU hardly ever reach their max speeds. During the stress test, the case heats up a little. The case only crosses the 40 °C mark near the heatsink. (±) The average temperature for the upper side under maximal load is 32.6 °C / 91 F, compared to the average of 29.8 °C / 86 F for the devices in the class Netbook. (±) The maximum temperature on the upper side is 40.1 °C / 104 F, compared to the average of 33 °C / 91 F, ranging from 21.6 to 53.2 °C for the class Netbook. (+) In idle usage, the average temperature for the upper side is 27.4 °C / 81 F, compared to the device average of 29.8 °C / 86 F.
Bay-Trail processors are not power-hungry. As such, the power consumption of the TravelMate is quite low. While idle, the consumption lies under 10 W - which is a typical value for this platform. At medium (3DMark06 running) and full load (stress test, Prime95 and Furmark running simultaneously) the power consumption lies at 13.7 and 10.1 W respectively. During the stress test, the power consumption is lower as the speeds of the CPU and GPU continuously fluctuate. In the practical WLAN test, our script loads websites every 40 seconds automatically. The power-saver profile is set on and brightness is regulated to around 150 cd/m². The TravelMate reaches a run time of 6:57 h - quite good. 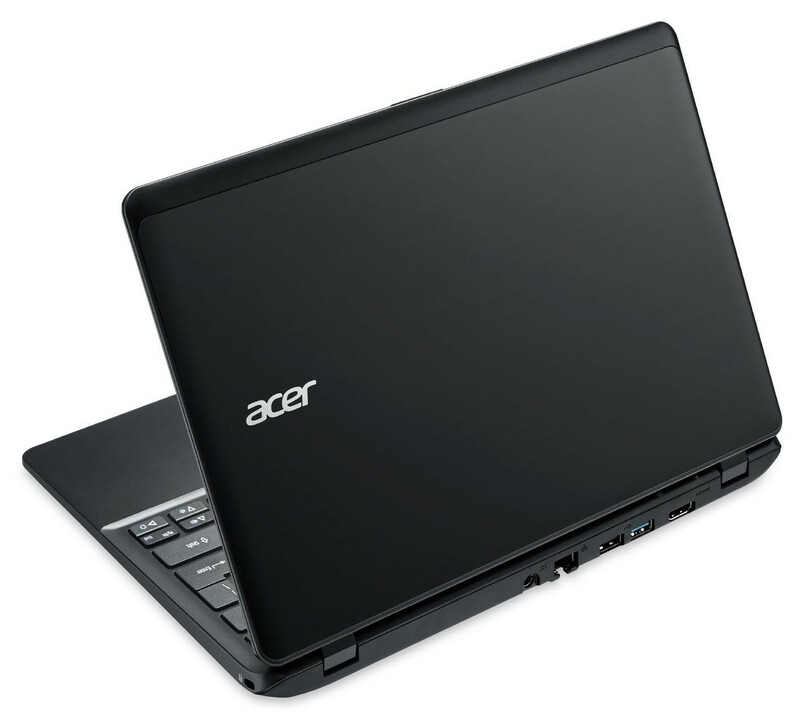 The Acer Aspire V3-111P runs for longer. We believe this is due to the higher idle power usage of our test model. The performance of the TravelMate B115-MP-C2TQ is sufficient for office and Internet applications. The small notebook has a good keyboard, runs silently and it offers long battery life. This makes the device ideal for surfing and typing. The same applies to the sister model, the Aspire V3-111P. The Aspire is aimed at private users, whereas the TravelMate is primarily for business users. As such, Windows 8.1 (64-bit) professional is installed alongside the Acer security software "ProShield." The TravelMate uses an IPS display with great viewing angles whereas the Aspire uses a TN panel with poor viewing angles. However, the Aspire offers a strong processor and longer battery life. The Aspire is currently available for around 380 Euros (~$461), whereas the TravelMate costs 420 Euros (~$510). Furthermore, both models are available without a touchscreen as well. The IPS panel and good battery life. Lenovo ThinkPad E145, Asus F200MA-CT067H, Asus EeeBook X205TA-FD005BS, Lenovo S20-30, Acer Aspire ES1-111-C56A, MSI S12T-3MA441, Acer Aspire V3-111P-P06A, Acer Aspire E3-111-C6LG.